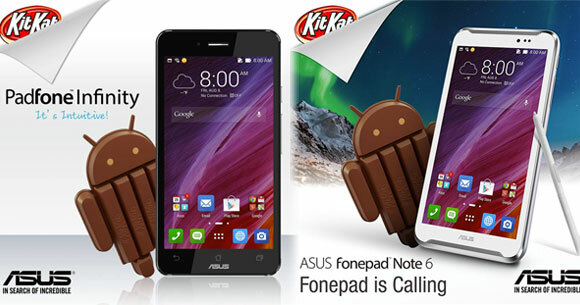 Asus announced that it is now seeding Android 4.4 KitKat update for the Padfone Infinity and Fonepad Note 6. The software update also brings along the company's latest ZenUI boasting refreshed visuals. The update isn't only about adding new features, but will also remove some of the previously loaded by Asus apps. Gone will be Buddybuzz, Car Home, Watch Calendar, My Library, My Bit cast, Pinpal, ASUS Sync, ASUS Echo, AO Link, Birthday Reminder, Mode Manager, System Bar Lock, Device tracker, Floating app and Quick Tool. Whew, that's a long list, but there are more apps that get modified. ASUS Studio gets renamed to Gallery, while ASUS To Do will be Do It Later from now on. On the Fonepad Note 6, the update improves radio modem stability as well as combining the App Locker feature into the custom launcher. The updates are quite large in size, the Padfone Inifinity's is 1GB, while the Fonepad Note 6's is 1.15GB. Follow the source links below to obtain the required files if you haven't received the notification already and have no more patience remaining. Is there an auto update of asus fonepad note 6, 4.2.2 to 4.4 kitkat android version? Please help on this.. Thank you.. Waiting for the OTA for the Infinity 2/new padfone infinity.